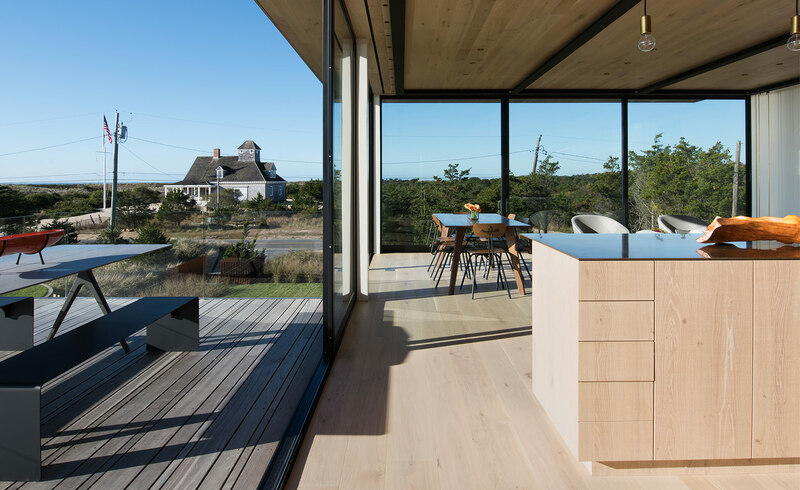 Inspired by the architecture of a century-old Life-Saving Station nearby, Bates Masi + Architects has infused local maritime history into the design of this residence in Amagansett, New York. The single family home was designed for a West Coast-based young entrepreneur with a penchant for the character of New England. ‘He wanted something to fit the beach lifestyle that is tactile and responds to the landscape and history of the area,’ says the firm’s owner and principal, Paul Masi. Shifting the large living space to the first floor, with the bedrooms on the ground level and an upper roof deck above, the residence echoes the typology of the Life-Saving Station, which was used as a look-out for shipwrecked sailors in the 20th century. The plan intentionally reduces the footprint of the house, minimising the environmental impact on the low dunes. This was one of the key challenges for the architects, who had to work with five regulatory agencies, on ‘everything from flood zones to max height restrictions’, says Masi. The main volume of the house, which draws on the post-and-beam style of the Life-Saving Station, is constructed of an exposed vintage steel frame and strong cedar beams. The lower volume contains cedar siding boards within a bronze grid, allowing the timber to expand and contract with the varying temperature and humidity of the dunes. Materials used were all chosen for their durability against the rough coastal climate and to react naturally to the environment. The cedar will gradually lighten in the sun and the bronze bars will turn dark brown, then eventually green from exposure to the salty wind. The house is raised above the flood plane, its elevation marked by a wrapping of steel, already developing an intense orange, textured rust. Interior details are inspired by the language of the Life-Saving Station, wherein boats are stored hanging from the beams. 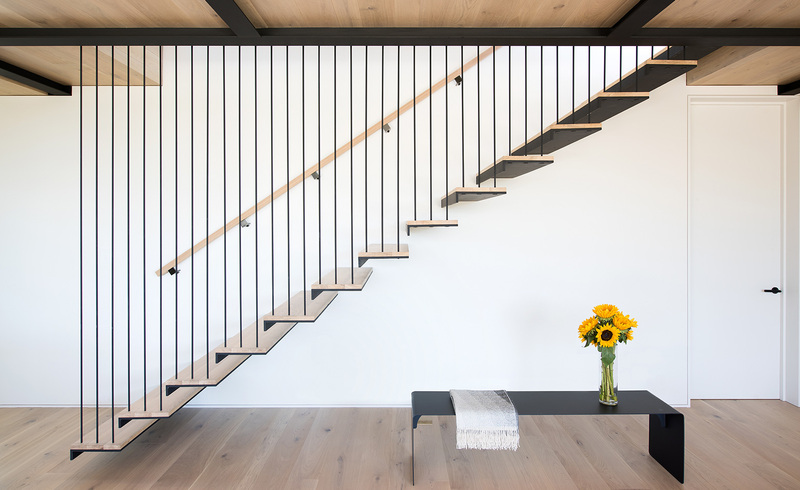 Black hanging rods support the treads of the main staircase, also functioning as a vertical hand guide and outside on the deck a wicker egg chair hangs from the cantilever, drifting in the breeze.